Fourier transform infrared chemical imaging in transmission mode has traditionally been performed on expensive mid-IR transparent windows such as barium/calcium fluoride, which are more fragile than glass making preparation in the histopathology laboratories more cumbersome. A solution is presented here by using cheap glass substrates for the FTIR chemical imaging which has a high-wavenumber transmission window allowing measurement of the C–H, N–H and O–H stretches occurring at ca. 2500–3800 cm–1. The “fingerprint” region of the IR spectrum occurring below 1800 cm–1 is not obtainable, however we demonstrate that a wealth of information is contained in the high wavenumber range using 71 patients on a breast tissue microarray (TMA) as a model for investigation. Importantly we demonstrate that the tissue can be classified into four basic tissue cell-types and that using just the epithelial cells, reasonable discrimination of normal and malignant tissue can be found. 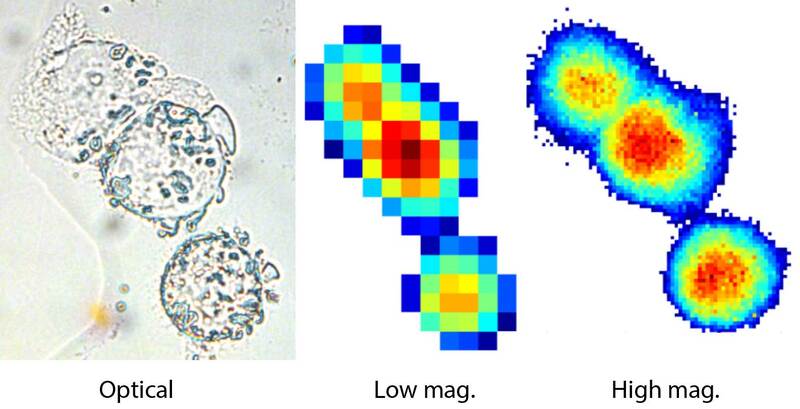 FTIR chemical imaging has been demonstrated as a promising technique to construct automated systems to complement histopathological evaluation of biomedical tissue samples. The rapid chemical imaging of large areas of tissue has previously been a limiting factor in this application. Consequently, smaller areas of tissue have previously had to be sampled, possibly introducing sampling bias and potentially missing diagnostically important areas. In this report a high spatial resolution chemical image of a whole prostate cross section is shown comprising 66 million pixels. Each pixel represents an area 5.5 × 5.5 μm2 of tissue and contains a full infrared spectrum providing a chemical fingerprint. The data acquisition time was 14 hours, thus showing that a clinical time frame of hours rather than days has been achieved.